Sample shown in navy ink with BINB typestyle with navy lining. Set of 25 flat note cards. Flat printed in your choice of ink color and typestyle. Size 6.25" x 4.5". Blank envelopes included. Printed return address and optional envelope lining available. Positioning only as shown. 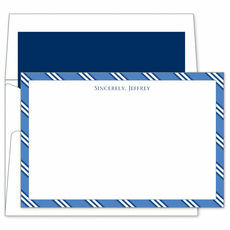 These notecards are perfect for a more masculine look! And they are our school's colors. We will be using these for graduation thank you notes.